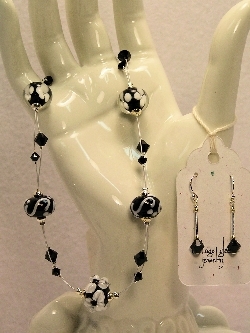 Fabulous 16" to 18" long double stranded silver accuwire necklace, interlaced with black and white lampwork beads, Swarovski crystals, and sterling silver beads and findings. Perfect for dress up... or dress down. Each piece of jewelry will come in a gift box. Please note: this necklace will be made as close as possible to the one shown above. Because lampwork beads are individually made by hand, each piece will be unique.